Legal and regulatory risks associated with alternative data are increasing along with media scrutiny as data diversity and usage grows, according to a white paper released by Integrity Research Associates. The paper argues that industry standards will be needed to blunt media criticism and reduce the risk of regulatory intervention. Integrity Research is also co-sponsoring, along with AlternativeData.org, a webinar on the topic Thursday, 25 January 2018, at 12:00 PM US Eastern. Because systematic use of alternative data is relatively new, it is only beginning to attract critical scrutiny from media and regulators. The US Securities and Exchange Commission has already successfully brought action in an insider trading case involving alternative data and prosecutors are reportedly considering other cases involving alternative data. The major risks associated with alternative data can be organized into a few major categories: exclusivity, insider trading, privacy violations and copyright infringements. In addition, there are other elements of risk such as poor data quality, difficulties in validating data, increased model risk, and the potential need for additional disclosures. Not all legal risks apply equally to all types of alternative data. Insider trading risks pertain most clearly to data which is non-public, which can be heightened by exclusivity agreements. Ultimately, the issue comes down to the consents obtained to collect the data and to distribute it to third parties. Consumer protection laws in the US and Europe increase the risks associated with data containing Personally Identifiable Information (PII). New EU regulation in the form of General Data Protection Regulation (GDPR) due to come into force in May 2018 will heighten risks associated with European data containing PII. 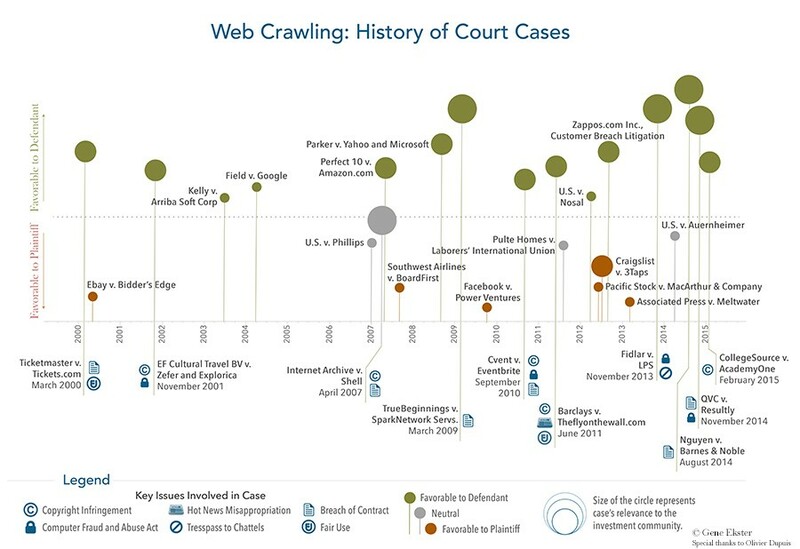 Violations of copyright law and related issues surround the harvesting of publicly available data typically available through the internet. Copyright law is not the sole issue for users of web harvested data, which can also run afoul of breach of contract, fair use, trespass to chattels and other legal landmines, as ResearchWatch contributor Gene Ekster has explained in the past. Integrity’s ResearchWatch has been closely following an ongoing legal battle between LinkedIn and hiQ Labs which draws on privacy laws and the Computer Fraud and Abuse Act. The 21-page report, “Mitigating Legal Risks Associated With Alternative Data”, was prepared by Integrity Research based in part on its coverage of the alternative data industry in its ResearchWatch news and commentary service. As close observers of developments surrounding alternative data, we believe that the alternative data industry is at a place analogous to that of expert networks a decade ago. Like alternative data, expert networks gained increasing adoption by asset managers, particularly hedge funds, and there was a dramatic increase in the number and variety of expert networks. Poor practices at a minority of expert networks fed a series of insider trading investigations which severely impacted the industry, causing many expert networks to exit the business. Nevertheless, by developing consistent compliance practices across the industry, the more compliant expert networks survived, and are now once again on a strong trajectory of growth. The alternative data industry is not immune to adverse media scrutiny, which in turn can lead to unwanted regulatory attention. The best protection for the nascent alternative data industry is to collectively create and adopt consistent compliance standards for the collection, dissemination and receipt of the data.